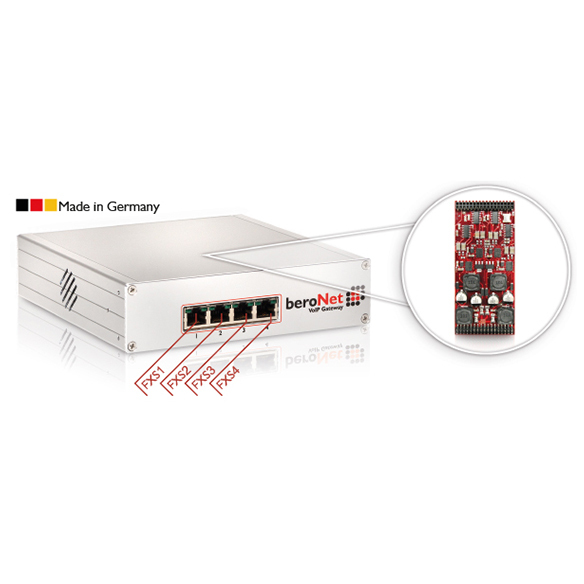 The beroNet 4 FXO Gateway is equipped with 4 analog FXO ports (Foreign Exchange Office). With the 4 FXO Ports, a soft PBX can be connected to an ordinary analog telephone provider. The Gateway connects SIP with analog in order to be connected to the public telephone network or to an internal analog connection of the telephone system. It can be easily extended by an additional module. 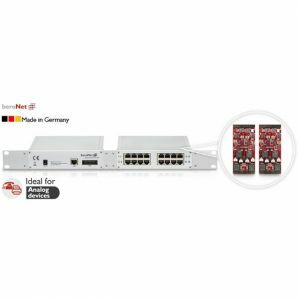 The beroNet 4 FXS VoIP Gateway (BF4004FXSBox) provides 4 analog FXS ports for the connection of analog telephones, Fax devices or modems. With transparent hardware bridging, potentially difficult services, such as modems or fax devices, can be connected to SIP Trunk or IP-PBX through a beroNet Gateway. The 4 FXS VoIP Gateway is also available as an 8 and 16 FXS Version. The beroNet 16 FXS VoIP Gateway (BN16FXSfax_B, BN16FXSfax_C) has been designed to allow an easy integration of older telephone systems into IP infrastructures. It can connect up to 16 analog devices (Telephone or Fax) to an IPBX. Ideal for hospitals, Student Residences, Hotels and Fax- Service-Providers.